The new Infinix Hot S4 is out and we have reviewed its features, price, and Full Specifications. The Phone features a 6.2-inch Fullview Notch display, which is an LCD Capacitive touchscreen. It is also powered by a MediaTek Helio P22 processor and runs on Android 9 Pie OS which is the latest version of Android. The RAM is its main Specs, it is up to 6GB, while the internal storage is 64GB, that's enough to store any Video or Files you may have. This is just the into to the device, now let's fully review Infinix Hot S4 Specs & Price. 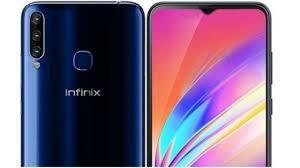 Infinix Hot S4 Phone has a screen resolution of 1520 x 720 pixels and a 19:9 aspect ratio, with a minimal bezel at the two sides, excluding the phone's bottom. The phone's back design is made of glass and has only Blue and Red colors available, also, it's water-proof. The Phone's Storage is really the exciting part, it's packed with an overly high 6GB RAM, this helps with the phone's liveliness and performance. The Infinix Hot S4 Storage for the device is 64GB, more files, videos, and large games can be stored, and if you still need more storage, you can insert external storage of up to 256GB via an External SD Card. The Hot S4 has a triple rear camera, It sports a 13MP rear camera, a secondary 13MP camera, and an 8MP wide angle camera. The front camera has a 32MP front selfie shooter which is located at the Notch.